Match Statistics In our database, there are 316 matches fought by El Hombre Bala. 96 wins and 135 losses were the results of those matches. You can see the detailed match statistics of El Hombre Bala here. 173 different wrestlers teamed with El Hombre Bala. To see who, you can click here. 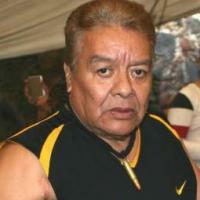 292 different wrestlers fought against El Hombre Bala. To see who, you can click here. There, you may also view the favorite and the least favorite opponents of El Hombre Bala.